The very first thing I did with this recipe was to boil the jars and lids first for 5 minutes to sterilize them, I did not come across any information regarding canning this product , so therefore I am putting them in the refrigerator and they will be consumed within a month or so anyway , they would not sit on the shelf around my house anyway , they go fast. Wash the eggplant in cold water , cut ¼ inch off ends, and peel the skin off with knife or potato peeler. Then cut lengthwise into ¼ inch strips and then cut strips into sticks resembling shoestring french fries . So we should have a nice pile of eggplant sticks. 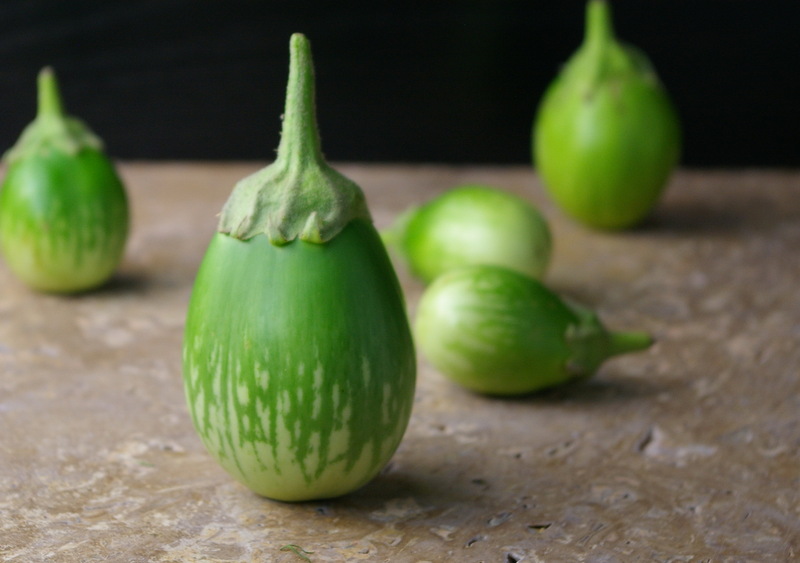 Place the eggplant into a large strainer that is sitting over a bowl, and sprinkle with kosher sea salt , there are no exact measurements for this step, just sprinkle them as if you were seasoning them. The salt will draw the water out of the eggplant. Place a plate over the eggplant sitting in the strainer, and put a heavy can or object on top of the plate to weigh it down, this will squeeze out the water. Let sit like this for 2 -4 hours. After 2-4 hours you have to rinse the eggplant in cold water 2 times to get the salt out , take handfuls of eggplant and squeeze out the excess water , then place on paper towels to pat dry. Then seed and chop the red pepper, and peel and chop the garlic . Bring the vinegar and water to boil , reduce to simmer and add the eggplant for only ” 2 ” minutes , this is important . Do not go over the 2 minute mark or the eggplant will become mushy. Remove from heat immediately and strain. 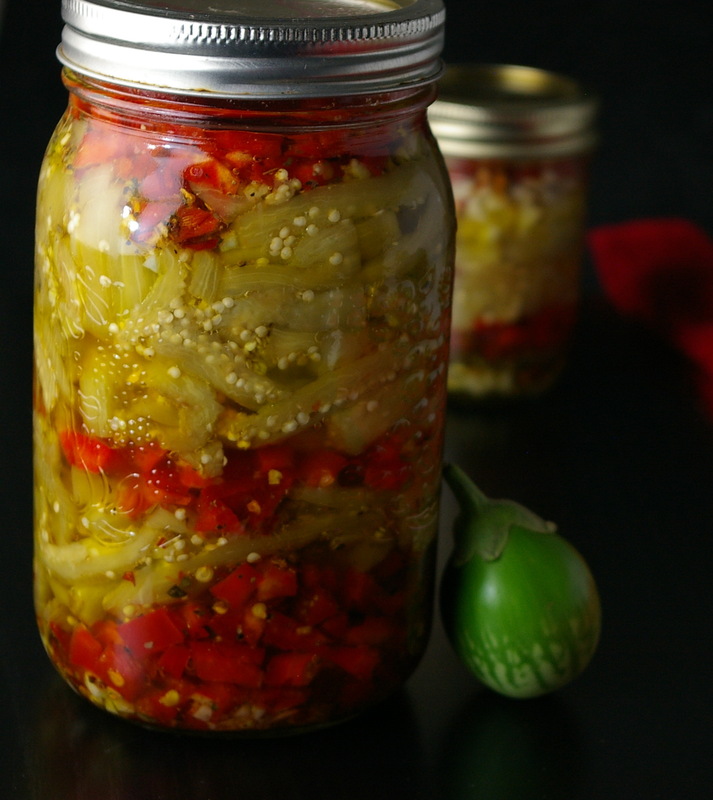 Take your jars and place ¼ cup (60mL) of the olive oil to the bottom of each jar, and add a spoonful of the crushed red pepper flakes, garlic, oregano, and pinch of black pepper , and some of the chopped red peppers. Then put in some of the eggplant making sure to pack it down tight, and layer it up with some more garlic, oregano,crushed red pepper flakes, pepper, and red peppers, you can add more olive oil as well , there is no specific science to this recipe. The best I’ve ever tasted were made by little old Italian ladies, with no measuring spoons so that is why I love this recipe. Once you have your jars filled add a little of the olive oil to the top and place lid on jars. Refrigerate for a minimum of 3 days before using. Take jar out of refrigerator for 30 minutes before serving as the oil may become thick from the cold. So there you go , I always loved this condiment and never thought of making it myself until I started growing eggplant myself , and had to think of other things to do with a surpluss of eggplant. I always say that people should not be afraid to try new things, and if you have the space try to grow something just so you can see how it grows and get to know it’s characteristics. So much of our food is purchased already processed and we are losing our knowledge of where food comes from . So explore , have fun , and enjoy! This entry was posted in Condiments, Home and tagged condiments, eggplant, garlic, Italian, Olive oil, oregano, pepper, vinegar by Ginger Smoothy and Otto Pilot. Bookmark the permalink. I am eggplant crazy!! I eat them a lot, all varieties. I love the small tender ones the best. And the White ones. This looks delicious I’ll have to try to make this sometime. Thank-you , I love eggplant too and really haven’t looked into many recipes for eggplant, but since I now know how easy they are to grow, will be looking at more recipes to try . i adore eggplant and have 2 recipes on my site but i love pickles too so will look forward to trying this, thank you. Thanks, I just added a picture to the end of the post , of the little babies from my garden, they are just so cute ! I’m not a huge fan of eggplant, but maybe trying it pickled will convert me! Love those cute little green ones, sitting there so proudly with their pointy hats on. First time I’ve see that variety!